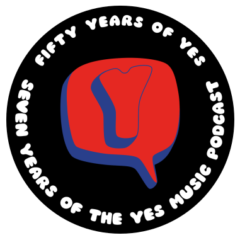 The fourth episode of the Yes Music Podcast featuring the fourth album, ‘Fragile’. What difference does the arrival of Rick Wakeman make? Is Fragile really an iconic masterpiece? How good are the solo experiments? Each episode grows stronger and more informative. I look forward to hearing your take on what I consider to be their masterpiece, Close to the Edge. Thanks for your efforts! Thanks for that, Michael! That’s a lovely comment. I’m also looking forward to the next episode! I am enjoying the Yes Music Podcasts immensely! Since I only became aware of them recently, I must go backwards a bit to the beginning. Well almost the beginning. FRAGILE was the first Yes album that I had heard, largely due to my love for the song Roundabout. At the time, around 1980 in Chandler Arizona, I was a freshman in High School. I purchased the FRAGILE album at the local Sears store for about US$7. I loved the Roger Dean artwork and was fascinated by We Have Heaven and is layered format and harmonies. The running footsteps leading to the creaking door opening was yet another reason to be fascinated by the innovative recording and my growing appreciation of progressive rock music. I certainly knew I was different from others in my school as I seemed to be the only kid into Yes, Genesis, The Moody Blues and ELO. Back to the album, South Side of The Sky was another standout track for me. In fact It would be several months before I even got to side 2. Originally I felt Heart Of The Sunrise was too jarring in it’s fevered urgency. The Fish sounded crazy and I was perplexed by Five Percent Of Nothing. Why was it so short? Mood for a Day did keep me returning to side 2 and of course now I am appreciative of the entire album, and consider it my favorite Yes album. After this I went back to Sears and bought THE YES ALBUM and CLOSE TO THE EDGE and finally TORMATO. This would be my Yes vinly collection for the next 30 years, although I did add 90125 and SYMPHONIC YES on CD format. Only recently have I began to experience all of Yes. In part due to this podcast and it’s guiding motivation. Thank you Kevin!